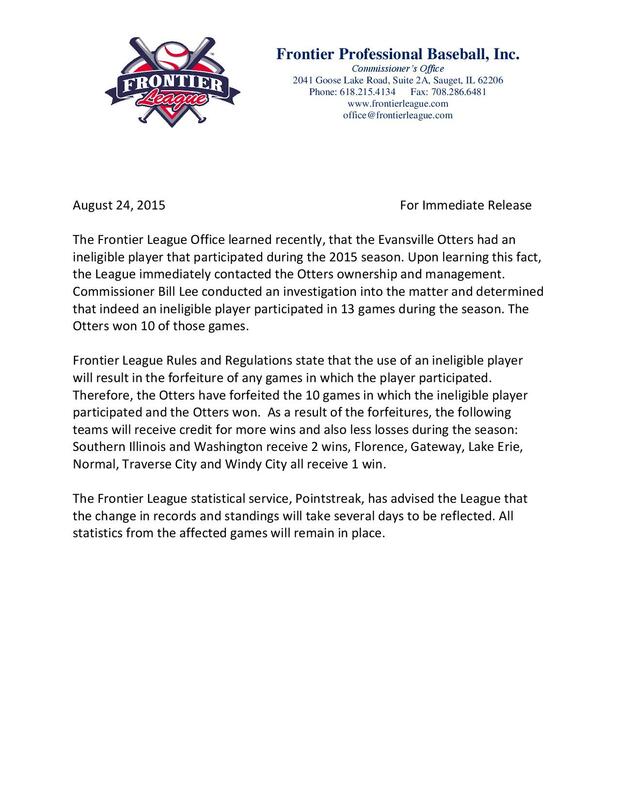 A press release was issued today by the Frontier League stating that the Evansville Otters must forfeit ten games after using ineligible pitcher, Will Oliver. The teams who suffered losses in those ten games will also be credited with wins. You can read about the original situation in my article, Why Isn’t Anything Being Done about the Evansville Cheating Scandal? The ruling, which includes forfeiting 10 games as well as monetary fines for the Otters organization and manager, is now being appealed by Evansville. You can read the whole article, as well as listen to the adjoining podcast HERE. If stats stay the same, who gets the GWRBI? W & L for pitchers? Save? Lot of crazy questions to be answered in a situation like this. After reading the other article, the league should be at some fault, they should not accept a contract or player unless they do some due diligence as well. Yeah.. I have no idea what is going to happen with all the specifics. And as far as the whole league thing (I agree with you), from what I’ve gathered through others within in the league in various positions… the managers and teams are ultimately responsible in making sure every player on their roster is eligible when submitting the contract. That’s probably why the league feels as if they can put it all on the Otters. I just heard that every single stat stays exactly the same. The only thing that is changing is the overall records.